the nelsons: book review...and club? 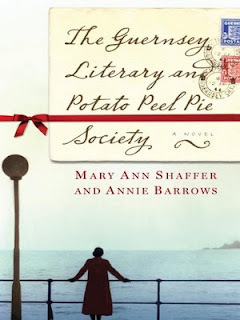 i just finished reading, The Guernsey Literary and Potato Peel Pie Society, by Mary Ann Shaffer and Annie Barrows...(ashley, this sparks my co-writing book interest even more)...and I adored it. it was an easy, light-hearted read that left me anxious for more and wanting to be the novel's main character, juliet. she was so delightful and witty and her penpals were so smart, polite and lovely that i kept forgetting that they were not my own friends...and i really wanted them to be. in addition to wanting to move to the island of guernsey and living the "simple life," it also makes me want to get back to hand-writing letters. what is more fun than receiving a nice little note in the mail from your loved one? don't be surprised if you start getting random mail from me. i can't recommend this book enough. it's the perfect read while relaxing in a bubble bath, so treat yourself. on another note, i've been pushing around the idea of starting an online book club. i figure everything else is done online now-a-days and until i live by my nearest and dearest, i thought this would do. it would basically be more or less, all reading the same book and sharing comments about it. easy stuff. let me know if you are interested. for the next month, i will be reading: The Whistling Season, by Ivan Doig and bird by bird: some instructions on writing and life, by Anne Lamott. p.s. i love book suggestions. You are seriously so cute! I would totally participate in the book club!! I've always wanted to start some kind of blog. I thought of doing a recipe blog for a long time. A book one would be fun! Let me know if you do! I'm also in. All I have been reading for the past year are children's books....trying to build my school library for when I start teaching....I need a reason to take a break form this madness and read some more sophisticated novels...ha. I've been planning to read that book this summer, but I may have to move it up on the list now. Lately I've been recommending the book Pope Joan, it is very interesting! okay Laura I just read The BOok Theif! It was soo good! It is narrated by Death during WOrld War II. It is really really good! I recommend it! Also These is My WOrds! Two favorites! PS i would love to do a book club blog! I read this book last week on my vacation and I loved it! You were right, the main character is great and the way the story is told through letters is so creative.